Peter Porte is a married man. He is married to Jacob Villere. The pair married on 7 October 2018. The couple does not have any children from this marriage. Furthermore, the marriage is going strong as there is no news regarding any extramarital affairs at present. 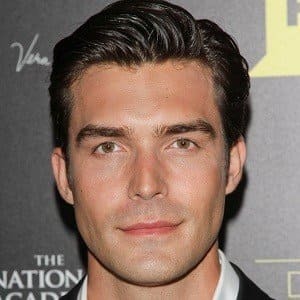 Peter Porte is an American actor. People mostly know him for his appearance in the soap opera ‘The Young and the Restless.’ Additionally, he also appeared in several other television series including ‘Baby Daddy’, ‘The Good Nanny,’ and ‘Living with Models’ among others. Porte was born in Greenwood Lake on March 31, 1985. He developed a keen interest in acting as a child and wanted to become an actor since a young age. He got his first acting gig when he was in his third grade. Peter is of American nationality. Furthermore, he belongs to the mixed ethnic background of Italian and Polish. Talking about his education, Porte attended George F. Baker High School and later graduated in 2002. Additionally, he earned a BFA in Acting at New York University’s Tisch School of the Arts. In addition, he also went onto study at the Royal Academy of Dramatic Art in London. Porte initially began his career as a model. In 2005, he had his first role in a TV movie as Jeremy in ‘University Place.’ Three years later in 2008, Peter appeared in TV series ‘Medium’, ‘CSI: Miami’, and ‘Viralcom.’ He also had the role of Tucker ‘Duke’ Benton ’66 in the TV series ‘Cold Case.’ Since then, he has appeared in several other movies and television series. All in all, he has over 30 credits as an actor. Some other movies and television series that Porte has appeared in include ‘Christmas Harmony’, ‘The Joel McHale Show with Joel McHale’, ‘Love, Once and Always’, ‘A Gift to Remember’, ‘Love at the Shore’, ‘New Girl’, ‘A Cinderella Christmas’, ‘Modern Romance’, ‘Telenovela’, ‘Last Will and Testicle’ , ‘Hot Fail’, ‘Mom’, ‘NCIS: Los Angeles’, ‘Devious Maids’, ‘Parks and Recreation’, ‘The New Normal’, and ‘The Young and the Restless’ among others. Porte received the Gold Derby TV Award nomination in 2012 for his performance in ‘The Young and the Restless’ in the category of Supporting Actor – Daytime Drama. Porte has not revealed his current salary. However, he has an estimated net worth of around $ 11 million at present. There were several rumors which suggested that Porte might have married recently. This later turned out to be true. At present, there are no rumors concerning Peter and his career. Talking about his body measurement, Porte has a height of 6 feet 0¾ inches (1.85 m). Additionally, his hair color is light brown and his eye color is dark brown. Porte is active on Instagram. He has over 63k followers there. However, Peter does not have his official Twitter and Facebook account. Also know more about the early life, career, net worth, relationships, and controversies of other actors like Joe Nipote, Malachi Pearson, Michael Damian, Spencer Vrooman, and Rocco Ritchie. Fox News Anchor Peter Doocy is Married. How is his relationship going on? Does he have any Children? Peter Mansbridge: his retirement, his romantic relationships, marriages and more! Read on it here! Peter Cetera: Twice Married; Twice Divorced! What’s his Relationship Status Now? About his Split with band Chicago and Absence in Rock n Roll Hall of Fame! !